My husband and I were itching for a road trip so one morning we woke up and decided we were going to head to Sedona, AZ. We’re lucky to have such a beautiful place only a few hours away from us. We stopped at a few places along the way to get our wiggles out. We’ve realized quickly that traveling with small children, frequent breaks are a must. These kids were troopers though. All Milo needs is a movie and she’s in her own zone that no one can break. Ruckus usually falls asleep for most of the trip or will end up watching Milo and just laugh at her doing nothing. 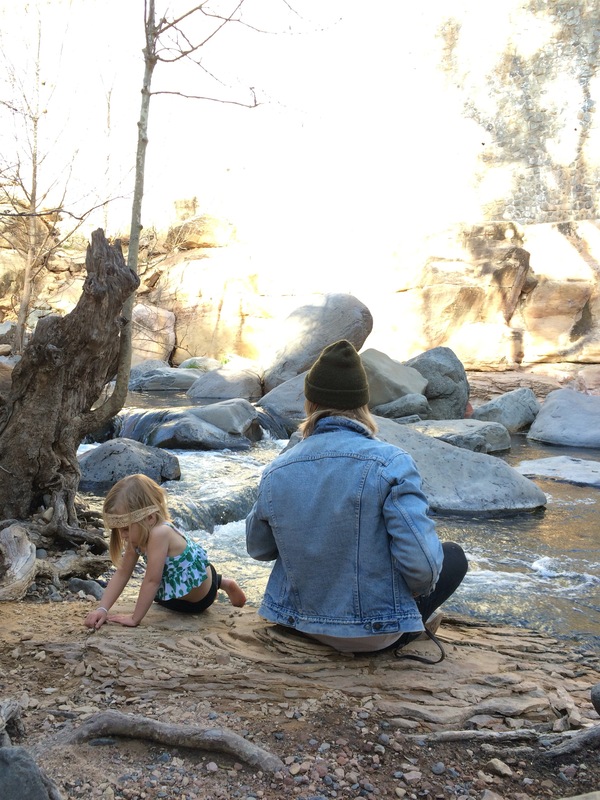 When we finally made it to Slide Rock in Sedona, we decided to go swimming before it got too cold. After that we noticed Milo was like a whole new kid, she began exploring and running around with so much energy. She was instantly obsessed with hiking and climbing up all of the big, giant rocks. There was no holding her back from running around like a little mountain goat. It was a thrill to see how much passion she had for something so new to her. We’ve been hiking a few times with her before but she had never tried climbing. Now we’re chomping at the bits to go back, we loved to see this mini mountain goat in action. I think a road trip is good for the soul. Ok cute Paige! Where are your black overalls from?! Love them!